Gold breaks $1,100: Does It Matter? Last week, gold prices briefly touched $1,100/oz before settling just under that number. Apparently the Indian government decided to sell US dollars and make a 200 ton gold purchase from the IMF, which created the spike in gold prices. Right now, the spot price for the yellow metal is $1,106. You may not realize it, but China is the world’s No. 1 gold producer, and its mine costs are much less than $1,100 per ounce. And given China’s propensity to put national well-being over any private individual or firm, they’re likely to just pay for the gold being mined at cost, which would be a lot lower than the spot price. China is the world’s biggest gold producer, so there’s no urgency for us, as there is for India, to snap up big volumes whenever they come onto the global market. It’s cheaper for us to buy gold from the Chinese market, but it doesn’t help diversify our huge foreign exchange reserves. To diversify our portfolio, we should spend dollars on things like gold. But the catch is that even if China bought half the world’s annual gold supply, it would only cost a few tens of billions of dollars, which is tiny compared to China’s huge reserves. China has 2.27 trillion dollars in reserves. Spending 25 Billion a year buying gold is chump change. The question that’s relevant is whether they will, because that will put upward pressure on gold prices. While its not obvious from the graph, the monetary base has in the past year. Its true that this money hasn’t worked its way in to the economy, but if and when it does we should expect higher inflation and a spike in prices of real assets like gold, silver and real estate. If I had a few trillion dollars, I’d be buying a few hundred tons of gold every year! Here’s an excerpt from a recent interview with Jim Rogers on why he prefers investing in China over India. High oil prices, inflation, food prices etc have hit countries like India very hard. How should counties like India tackle the situation? • Inflation affects everyone. Not just India. We pay the same price for copper. Copper price is the same in Australia, Germany and the US and India. India is not getting any worse than other countries. Except for the fact that the Indian government spends periodically more money in controlling inflation. The problem with India is that your politicians are worse than American politicians. You know Indian politicians believe and argue that the cause for inflation is commodities trading. How absurd is that. Recently India banned Futures trading in some commodities like rice, wheat, rubber, potato etc to control price rise and inflation. • It is the same tactic that politicians have done for hundreds of years everywhere in the world. Politicians would blame for anything wrong on three groups of people. They blame financiers/financial types. They blame foreigners: It is always good to blame foreigners. And they blame the Press. They blame you guys for commodity inflation in India. If the Press is not writing about inflation, we would not have a problem, politicians would say. It is absolutely insanity. India banned Futures trading in some commodities without any logic or reasoning and study. And it has not done anything good for commodities in India or in the rest of the world. The commodity prices are still up and up. India needs to understand that there is no easy solution to high prices. As prices go up, people use less of anything and people would continue to produce more and that has always been there in the boom market. I read that India produces lots of foodgrains and do not have storage facilities and tonnes of rice and wheat are destroyed in public sector storage facilities. How sad it is. It is terrible thing to happen. So let India do things to protect commodities rather than ban Futures trading in them. By banning commodities in boom market, the Indian government is making things worse. Look at China. The Chinese instituted price controls. Price controls have been around for thousands of years. They always make things worse. If you tell somebody that rice is only Rs 2, you have no other ways. If you tell a farmer that you can sell rice only for Rs 2, he will tell I am not going to produce any more rice. Farming is hard work. I cannot make any money with price controls by producing and selling rice for Rs 2. So then you have less rice and shortage of rice. Even Romans had price controls, it never worked. So the Indian government is making things worse for India. It has been making things worse for the people in the last 50 or 60 years. Some politicians in India blame commodity Futures trading as the reason for price rise; inflation is a big political issue in India. •By banning commodity Futures, food prices would not go down. Because people sell in any prices they want to in Futures. So banning Futures is a senseless decision. In commodities market, we know what the price of wheat is. There is a public price for wheat according to demand and supply world over. So India banning Futures does not have any effect on wheat market. Indian government instead of being transparent and serious is creating lots of black market by banning Futures trading. It is going to make lots of people desperate. Politicians have been doing the same thing for many years, all over the world. Not just in India. It is worst for all of us. What is the reason for the global food crisis now? • The number of hectares of global wheat farming has declined over the years. The inventories of food are in the lowers ebb now in the last 50-60 years. In the last 30 years, farming has been in a terrible state. There is a terrible shortage of farmers now across the world. Young people do not go for farming. They study computers and get jobs. All the farmers in the world are old now. They are all men. Young people do not go to farms these days because farming is a hard physical job. Seeds, fertilizers, tractors…there is a shortage for these stuff. We have a shortage of even tractor tyres now. That is the reason why we have shortage of food and there is a food crisis. It is not again speculators who have created the food shortage. Speculators take delivery of wheat. They don’t hoard wheat; it is the government that is hoarding wheat. It is the governments that are making the prices higher. Argentina says you cannot export wheat. A lot of counties say you cannot export wheat. The governments should call farmers to produce more and invite more people to farming by offering incentives. When farming is coming down, governments like in India are trying to introduce price control mechanisms and bring down prices, and ban Futures. So things are getting worse. Things will be bad if it goes like this way. The food crisis will get worse, if countries act like this way. There will come a time when people will not get enough food. They are going to starve. The world is going through several weather problems. There will be droughts. So things are getting worse for farmers. I promise politicians who rule us are not going to go to the fields and cultivate. Do you think your politicians will go to the fields and work hard till evening to raise more rice? No way. US President George Bush recently commented that it is the large population in countries like India and China that are causing the food shortage and crisis. • I don’t agree. Look how things are blown out of proportion by politicians. Why can’t the people in Asia eat and live happily? Is it the prerogative of the US that only they should eat? There are three billion people in Asia. Thirty yeas ago Mao Tse-Tung was still running China. Thirty years ago Indira Gandhi was running India. Vietnam was destroyed. Now there are three billion people in Asia, working hard, saving and investing. They want to eat more and they should. There is nothing wrong in that. Why should the developed world say that you should not eat? That is discrimination. I hope Asia continues to consume more so that their standards of living would go higher. All the western politicians who say that Asia should not eat more, let them go to the fields and work hard and produce more wheat, rice and maize so that food prices do not go higher. Do you think India and China are driving the global commodities prices? • Not just India and China. Most countries are driving the global commodities prices. America consumes lots of sugar, wheat and petrol. Europe does, everybody does. If America stops using petrol, there will be lots of petrol available in the world. If Europe stops eating wheat, there will be lots of wheat available. So what I want to say is that everyone is driving the global commodities prices. Everyone in the world is driving the demand for everything. Which is the commodity you are most bullish on these days? Gold or Crude Oil? • I am not particularly bullish on a commodity. I am in fact bullish on all commodities. I am not a good market timer. I am a very good or a very bad sure time trader. So I have no idea. I own all the commodities. I go to commodities based on historic fundamentals. You recently said that it is the right time to invest in agri-commodities. Is there great investing opportunities in agri-commodities? • I have bought into agri-commodities recently. I am an admirer of agri-commodities, and I hope there are great investing opportunities there. I make plenty of mistakes. But I try to buy commodities cheap. And agri-commodities are cheap and thus hold great investing potential. What do you think of Indian stock market? Is it overheated and overpriced? • It was certainly overheated, and that is why it has come down crashing recently. I am not a good judge of the Indian stock markets. Sometimes I get the Indian stock markets exactly right. Sometimes I get it exactly wrong. So I am not a good judge. So, I would not buy Indian stocks because it is too high. And your government continues to do stupid things like don’t trade in commodities. So if I am a foreigner I cannot invest in Indian commodities. It is sad. Vietnam recently said all the problems is because of importing gold. So don’t import gold. So Vietnamese cannot import gold. Most astonishing thing. So governments keep doing these kinds of things. Vietnam said their problems are because people have been buying gold. Come on, how crazy can you go? Don’t worry; politicians can go crazy at any lengths. You know America said there were weapons of mass destruction in Iraq. There were not. They spent hundreds of thousands of billions and killed tens of thousands of people to find those weapons. So politicians do a lot of crazy things. Among the three emerging nations, Russia, India and China, which one would you rate first as an investment destination? Why not India? Can you compare China with India? • Indians have the worst bureaucracy in the world. India learned bureaucracy from the British. Indian bureaucracy has remained stagnant. Just stagnant. They do what they think only. There is no proper education, no infrastructure in India. It is the most wonderful country in the world. I admire India’s diversity. I tell my friends, if you can only visit one country in your life time, go to India. India is an amazing country. But as a place for investment? Oh, no, I would think twice. Even Indians who have been doing great business elsewhere in the world, and when they go back to India to do business, it has not been a good experience for them. Many of them get out of the business and go back to other countries to do business. You have driven through India? • I have driven through India a couple of times extensively. In 1988 and 2001. It was spectacular; it was wonderful. I loved it. I love traveling across any place. You learn a lot about that place while traveling. The highway from Kolkata to Mumbai should be one of the greatest highways in the world. But the Indian infrastructure development is so bad, that it took seven days for me to cover Mumbai and Kolkata highway. But everyday in India was an adventure, which I loved. Yes, it is a great place to travel. But if you looking for efficiency and investment, it is not the right place yet. So it is better to go to China? • Yeah, in China, a truck driver travels 70 km an hour average. China has the best roads in the world. On the Mumbai-Kolkata road, a truck driver goes 20 km an hour. That shows the efficiency between the nations. To cross state boarders in India, it is a nightmare. In China, it is all great. In China, they do what they say. In India, the government says lots of things, and they do not do it. Yes, smart Indians make lots of money. There are several success stories in India. India has the most beautiful women in the world, but has the worst politicians and bureaucrats. If you haven’t read his latest book, A Bull In China, I strongly recommend it. 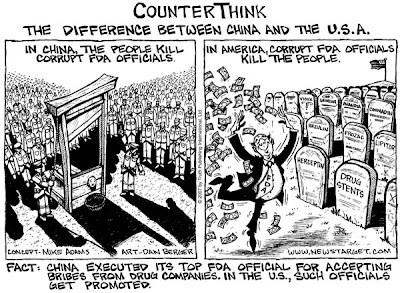 In case you didn’t hear, China executed its FDA chief today. The had sentenced him to death just over a month ago. And instead of waiting for 10 years to exhaust the appeals, they just killed him and put an end to the story. In one fell swoop, China just reduced the average life expectancy for its FDA chiefs!